homemade cinnamon sweet + salty superfood granola! i always tell friends and family who ask me for advice on what they should do to lose weight, get fit, have more energy, or fight depression how critical breakfast is. not just that you have it, but when you have it, what you have, and how you have it. i learned the hard way, and i’ve come a long way from when i used to skip breakfast entirely (aside from cigarettes and coffee). i call it my 12 hour anti-diet break-fast, and i let you in on my 3 simple tricks here. 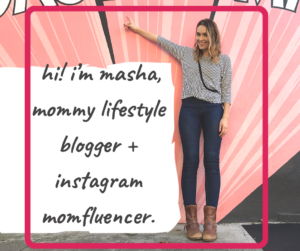 it’s a key part of how i beat depression without medication, and how i lost 45 lbs postpartum without giving up dessert, dieting, or working out. 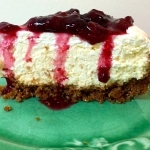 enticing breakfast recipes are key. 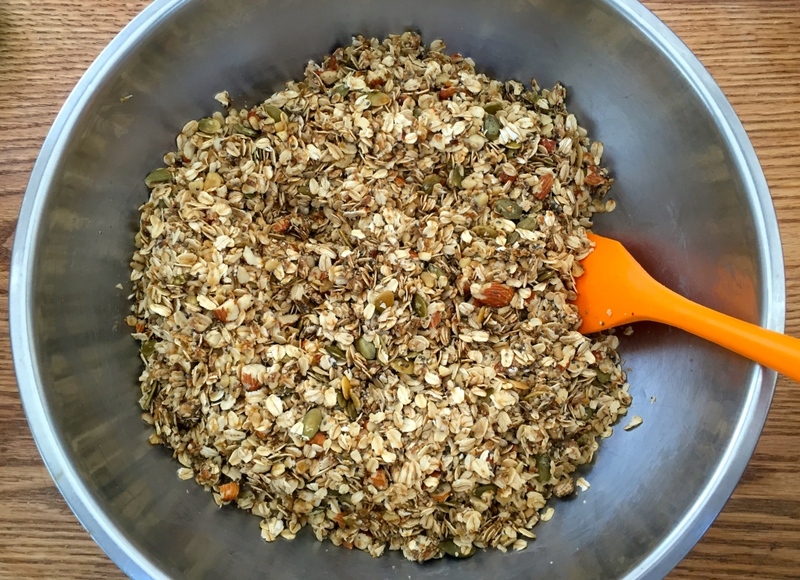 i’m all about healthy comfort food, so i created this superfood granola to be a delicious snack and breakfast, whilst being chock full of antioxidants, omega 3s and vitamins. i like my granola on a bed of organic whole milk (not low fat!) yogurt and fruits. 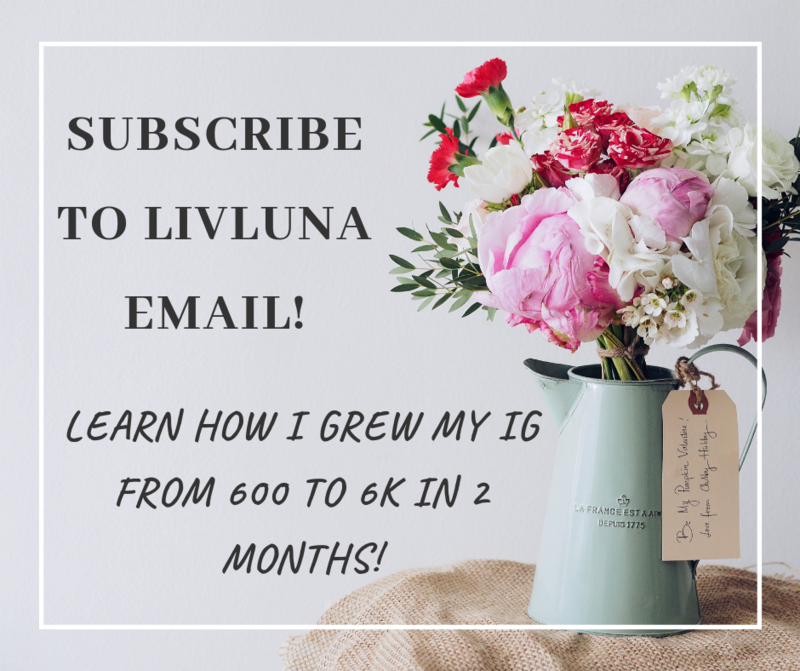 my inspiration was to get my husband off of the store bought cereal he devours in an effort to lower his hereditary high cholesterol without medication, and create a simple, healthy breakfast he would love, while saving money on groceries. what’s wrong with store-bought cereal? well that depends on the kind you buy, and i get it, it’s easy, quick, and satisfying. it’s also very expensive, usually packed with sugar, is processed and has ingredients that are not the optimal way to start your day and rev up your metabolism. 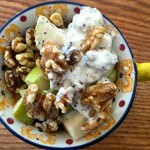 before baking, stir in the melted mix in a large bowl with a spatula to get the granola coated as evenly as possible. 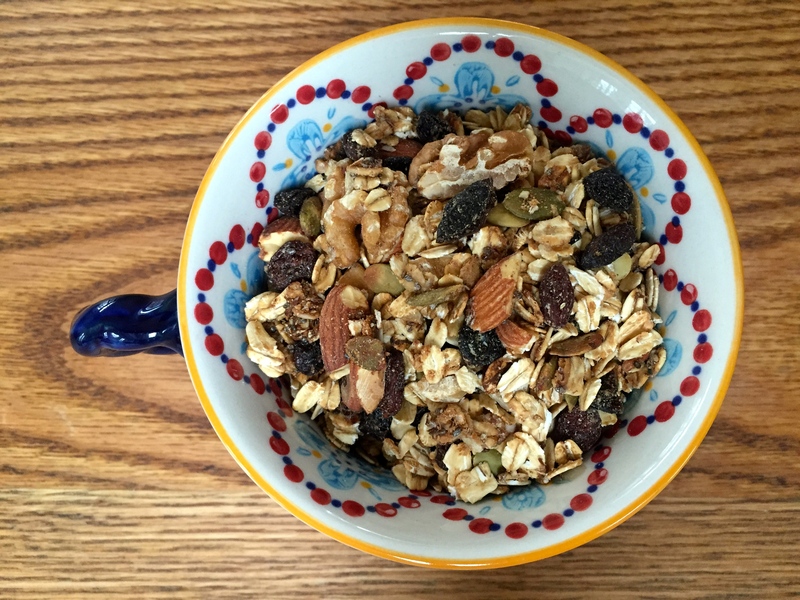 the best place to shop for making your own granola is Costco. i LOVE Costco for so many reasons. but mainly, it’s because i can find healthy, and organic products in bulk sizes at lower costs. i buy all my nuts and dried fruit at Costco. the nuts aren’t organic, but the dried fruit is, and is unsulfured, and has no added sugar. i also buy my sweet secret at Costco: organic unrefined coconut sugar (scroll down for health benefits). it satisfies my sweet tooth without flooding my body with processed sugar. in the recipe below i’ve marked which ingredients i can buy in bulk at Costco- you’ll be surprised, it’s most of them! i buy these organic dried & unsulfured fruits at Costco! 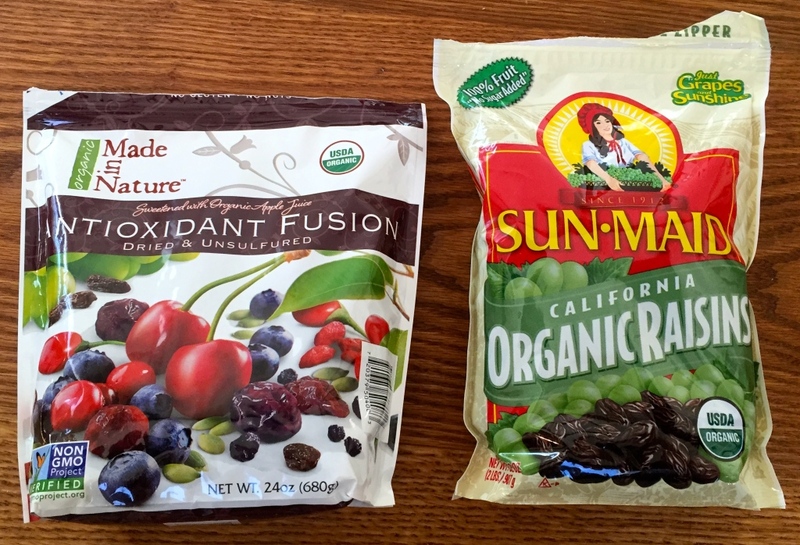 my Costco carries Made in Nature’s Antioxidant Fusion, which is a big bag of dried & unsulfured mixed cranberries, goji berries, blueberries, cherries etc without added sugar! most dried fruit, especially cranberries and cherries, has tons of added sugar, so check your labels! 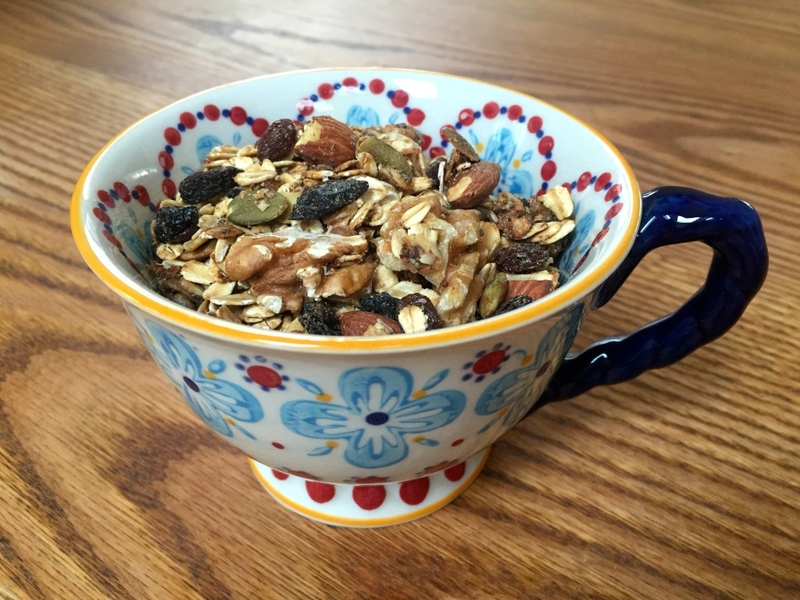 i make a batch of granola once every 2 weeks. i use a very large baking pan, that is one inch deep and 21×15 inches in size, so that it takes up the whole oven space. 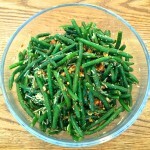 this allows for the granola to be spread thinly and get nice and crunchy and form delicious clusters. 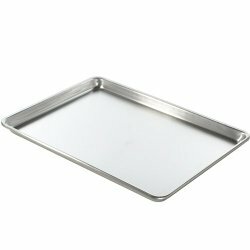 i highly recommend buying one this big, because it’s also ideal for roasting vegetables, and baking cookies. here’s a perfect one on Amazon. i store it in an airtight jar. when we have house guests, i make it once a week, because once they discover it, they want to snack on it, in addition to having it for breakfast! i like mine with hot organic milk, or like swiss muesli with plain whole milk organic yogurt and sliced fruit. my hubs prefers it with cold organic almond milk. making a big batch means you also have it on hand for fantastic easy last minute gifts when you need a hostess gift etc. 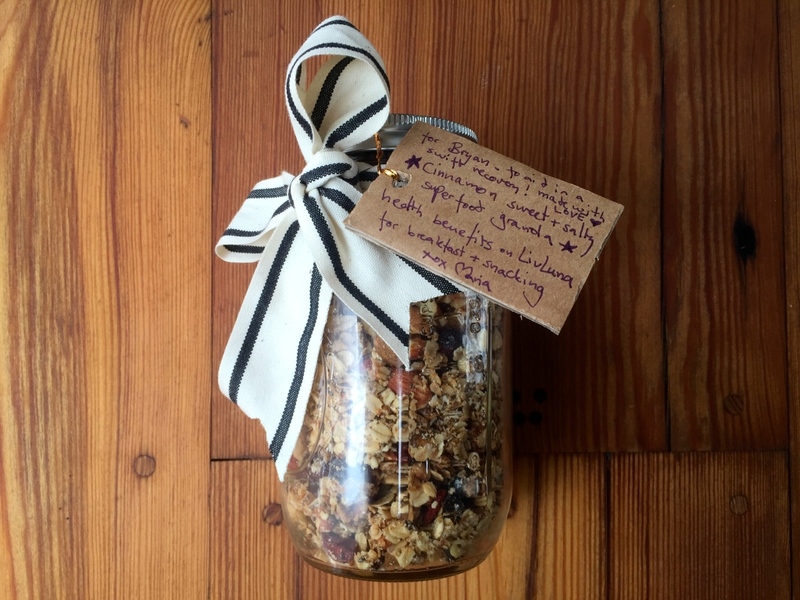 check out my simple DIY post for a beautiful homemade gift idea: superfood granola in a Mason Jar! a get well gift i whipped up in five minutes. click the pic to see more! raw almonds – high in antioxidant vitamin E, boost vitamin E levels in your blood, have lots of copper, magnesium, protein, riboflavin, and l-carnitine, high in healthy unsaturated fatty acids, help lower LDL cholesterol, help protect artery walls from damage, help reduce your risk of heart disease, help prevent diabetes by lowering blood sugar and insulin, alkalize the body. 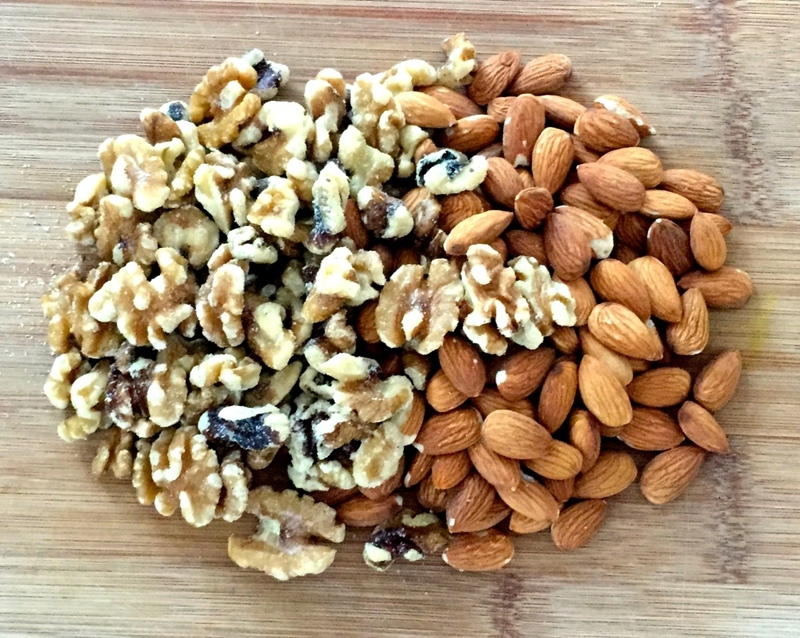 almonds and walnuts are mindblowing superfoods. organic raisins and dried berries– high in vitamin A, A-beta carotene, A-carotenoid, and levels of catechins- polyphenolic phytonutrients, antioxidants that attack free radicals and help prevent cancer, reduces hypertension, blood pressure, lowers insulin response, prevents diabetes, prevents anemia due to high iron content, helps treat erectile dysfunction, high in potassium and magnesium, neutralizes acidity in body, supports eye health. organic raw pumpkin seeds– high in omega 3 ALA’s, magnesium, manganese, copper, protein, zinc (supports immune system, cell growth, mood, sleep, eye and skin health, male sexual function, and prostate health), phytosterols, antioxidants, benefit your heart, liver and immune system, help fight diabetes and regulate insulin, relief of menopause symptoms, lowers blood pressure, high in tryptophan (which converts into melatonin and improves sleep), has anti-inflammatory effects, helps treat arthritis. organic chia seeds– incredible amounts of nutrients in tiny seeds, loaded with antioxidants, fiber, calcium, high quality protein, high in omega 3 fatty acids, help lower the risk of heart disease and diabetes, increases athletic performance. organic flaxseed meal– high in omega 3s, lignans and fiber, helps fight heart disease, diabetes, breast cancer, prostate cancer, and colon cancer, prevents hardening of arteries, reduces plaque buildup in arteries, reduces bad cholesterol, reduces inflammation, and menopause symptoms. 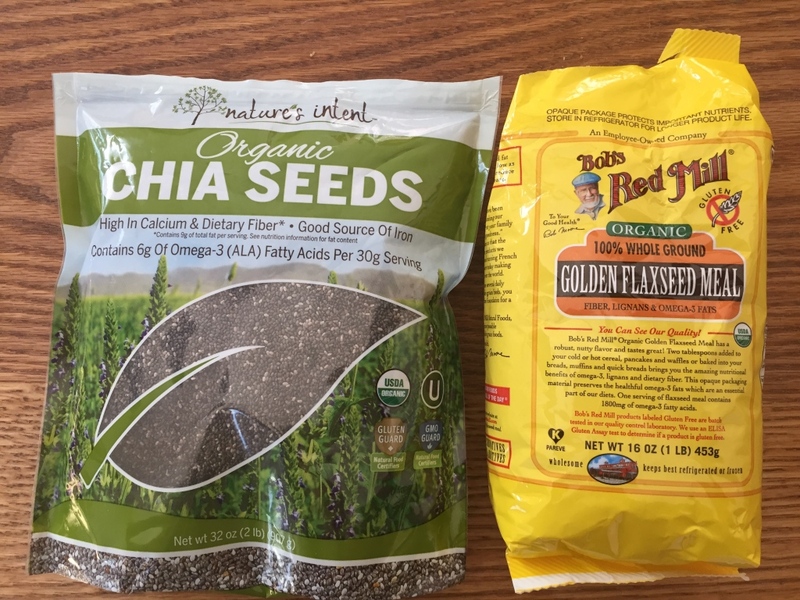 organic Chia Seeds from Costco, organic Flaxseed Meal from Whole Foods. coconut oil– coconut has medium-chain triglycerides, including omega 6 essential fatty acid. these good fats are not stored as fat in your body but easily burned for energy. one study found that women who consumed 2 tbsp of coconut oil a day had less abdominal fat than those who didn’t! coconut also has an unusually high amount of lauric acid in it, which is found in breast milk and builds your immune system. it has effective antibacterial, antiviral, antimicrobial, antifungal properties that can fight viruses, bacteria and infections. It even fights off yeast and candida. lauric acid also reduces bad cholesterol levels, which lowers heart disease and stroke risks. it can also boost and restore normal thyroid function. nd finally, coconut is rich in antioxidants, vitamins C, B, E, potassium, magnesium, phosphorous, and iron. magnesium calms nerves and helps regulate blood pressure. read more about the health benefits of coconut in my post on coconut milk. coconut sugar– coconut sugar is granulated coconut nectar, and is a sustainable alternative to processed sugar. it’s like a light caramel malty brown sugar, but unlike sugar, it has a much higher mineral content, vitamins, and amino acids. it’s also a low glycemic food, ie the sugar is released slower into your blood, so your body is not flooded with refined sugar. it tastes so delicious. honey- antibacterial, antifungal, antiviral, reduces risk of cancer and heart disease, reduces ulcers and gastrointestinal disorders, increases athletic performance, regulates blood sugar, heals wounds, and skin. cinnamon- antibacterial, antifungal, helps treat diabetes, diarrhea, colds, may help prevent Alzheimers, treat MS, reduces bad cholesterol. hi Laura, thank you. i hope you like it. let me know how it turns out if you make it!